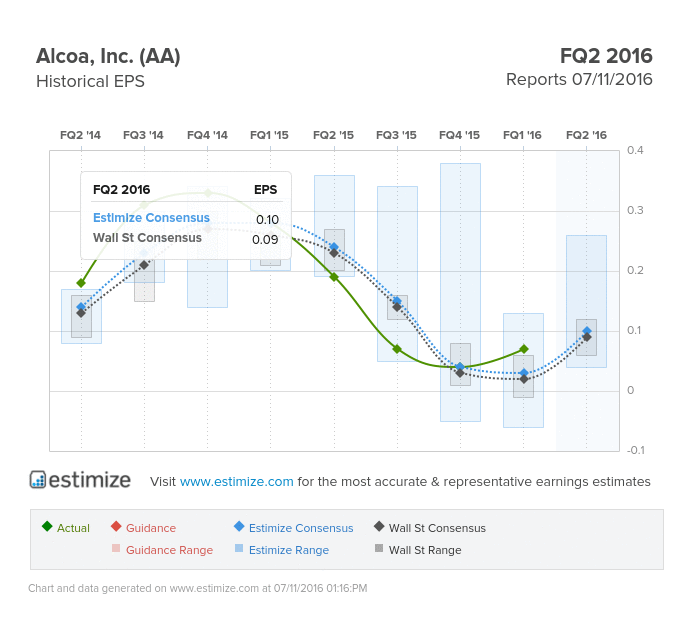 What Tone will Alcoa Inc (AA) Set to Start Earnings Season? What do you think will happen in AA’s report? Click here to estimate! Alcoa, the global leader in lightweight metals technology, is prepared to kick off earnings season, as it typically does, with second quarter earnings this Monday. Alcoa is coming off a mixed first quarter, beating on the bottom line by 4 cents but missing its sales target by over $300 million. 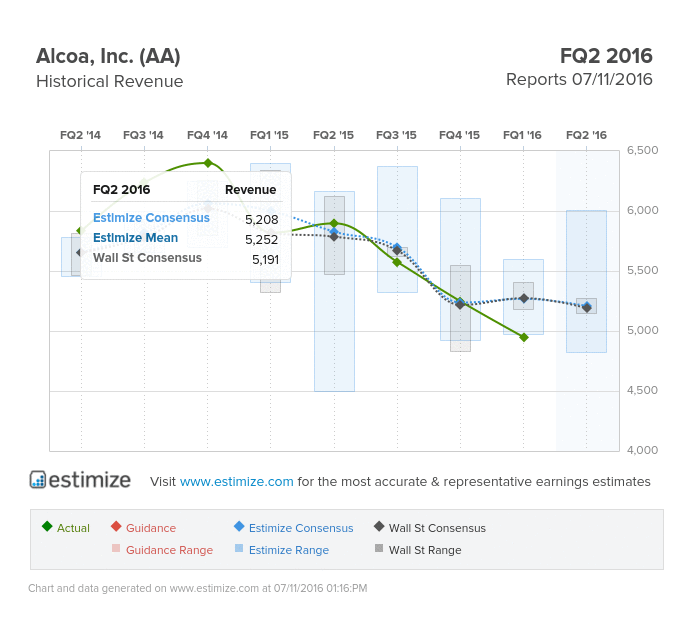 Alcoa is still seeing unfavorable year over year growth which is expected to continue through fiscal 2016. The Estimize consensus is looking for earnings per share of 10 cents on $5.21 billion in revenue, 1 cent higher than Wall Street on the bottom line and $17 million on the top. Compared to a year earlier this reflects a 46% decline in earnings with sales expected to drop by 10%. Given Alcoa frequently reports negative growth, the stock often turns to the red in the moments following a report. Alcoa shares typically decline by 2% in the 5 days following an earnings report. Alcoa primarily deals with the production of aluminum and alumina metals. Unfortunately, aluminum has suffered from oversupply and weakness in China. As a result, the metal has reached a six year low and has put pressure on corporate earnings. Alcoa has struggled with a slowdown in non-residential building and construction divisions in Europe, Canada and the United States. Topping it all off, the strong U.S. dollar, weak commodity prices and global volatility should take its toll on earnings. Overall the company is struggling in its upstream and value added sectors. Last quarter, revenue from its value added segment declined 2.2% while the upstream business plummeted over 32.3%. Alcoa has also indicated that demand from its aerospace, heavy truck and trailer are expected to be lower. Aluminum production is also expected to have fallen in Q2 both sequentially and from a year earlier. On the bright side, Alcoa is implementing new cost cutting initiatives and streamlining assets in order to boost margins. Earlier this year, Alcoa announced plans to split into two publicly traded companies. One will handle the portfolio of downstream assets and the other will maintain the commodities business. The split is expected to relieve pressure on margins and improve productivity. Do you think AA can beat estimates? There is still time to get your estimate in here!